1. Did your opinion about Mitch change as book went on? In what way? 2. Who do you think got more out of their Tuesday meetings, Mitch or Morrie? In what ways? How do you think each would answer this question? 3. Do you think Mitch would have come back to Morrie's house the second time if he hadn't been semi-idled by the newspaper strike? 4. 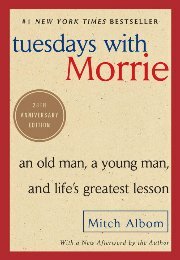 Discuss Morrie's criticisms of Mitch throughout the book. Do you think Morrie should have been tougher on him? Easier? 5. Do you think Mitch would have listened if Morrie hadn't been dying? Does impending death automatically make one's voice able to penetrate where it couldn't before? 6. Does this book make Morrie's death a public event? If so, how is it similar to other public deaths we've experienced as a society? How is it different? 7. Morrie referred to himself as a bridge, a person who is in between life and death, which makes him useful to others as a tool to understand both. Talk about other literary, historical, political, or religious figures who have also served this purpose. 8. Most of us have read of people discussing the way they'd like to die, or, perhaps, have been a part of that conversation. One common thought is that it would be best to live a long, healthy life and then die suddenly in one's sleep. After reading this book, what do you think about that? Given a choice, would Morrie have taken that route instead of the path he traveled? 9. On "Nightline," Morrie spoke to Ted Koppel of the pain he still felt about his mother's death seventy years prior to the interview. Is your experience with loss similar or different? Does what you've read in this book help ease any of that pain? 10. Morrie was seventy-eight years old when diagnosed with ALS. How might he have reacted if he'd contracted the disease when he was Mitch's age? Would Morrie have come to the same conclusions? The same peace and acceptance? Or is his experience also a function of his age? 11. Try the "effect of silence" exercise that Mitch described in your class or in your group. What do you learn from it? 12. Talk about the role of meaningful coincidence, synchronicity, in the book and in Mitch and Morrie's friendship. 13. Morrie told Mitch about the "tension of opposites" (p. 40). Talk about this as a metaphor for the book and for society. 14. Mitch made a list of topics about which he wanted Morrie's insight and clarity. In what ways would your list be the same or different? 15. Discuss the book in terms of structure, voice, and tone, paying attention to Mitch's use of flashbacks and other literary devices. How do his choices add to the meaning? 16. Are college students today missing out because they don't have the meaningful experiences that students in the 1960s had? Do you think Morrie thought they were? 17. Morrie said, "If you've found meaning in your life, you don't want to go back. You want to go forward" (p. 118). Is this true in your experience? 18. Morrie believed, "You have to be strong enough to say if the culture doesn't work, don't buy it. Create your own" (pp. 35-36). How can people do this? How can this book help? 19. As his visits with Morrie continued, Mitch explored some other cultures and religions and how each views death. Discuss these and others that you've studied. 20. To the very end, Mitch arrived at Morrie's house with food. Discuss the importance of this ritual.